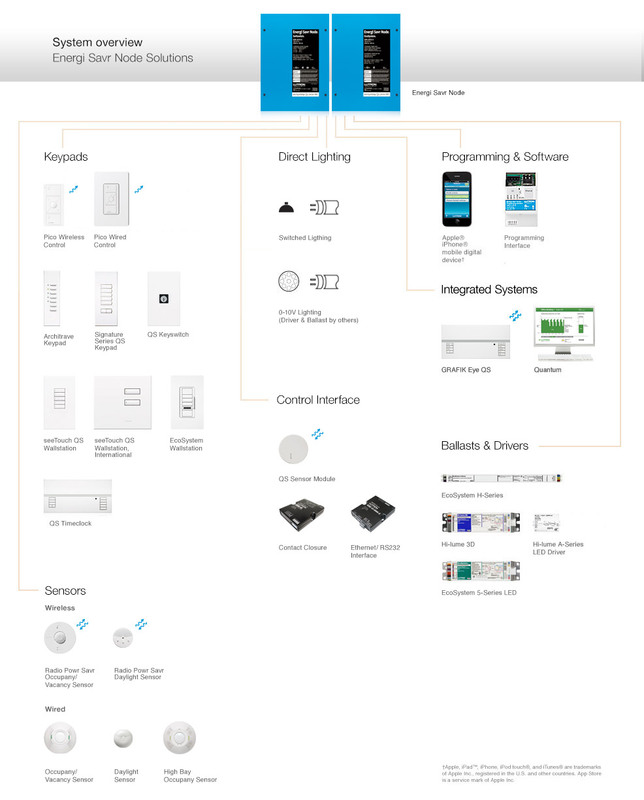 The diagram above provides an overview of the components that constitute the Energi Savr Node Solutions, as well as compatible Lutron products. You can refer to the categorized list below to find a complete list of components with more detail about select products. Power interfaces provide additional flexibility. Pair Energi Savr Node Solutions with other Lutron products to make your entire lighting system more efficient and adaptable. Setup and operate all aspects of Energi Savr Node with Softswitch using these convenient interfaces. Control Energi Savr Node with Softswitch at the touch of a button with programmable, easy-to-use keypads. Lutron sensors automatically turn lights on when a room is occupied and off when a room is vacant or based on the amount of daylight available. The Energi Savr Node Solutions use the following interfaces for convenient, reliable light control. Note: indicates wireless communication functionality. For details, consult each product's specification details.